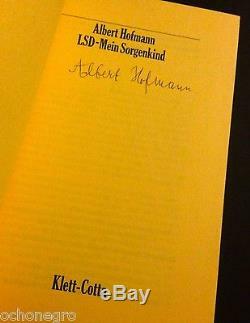 Signed by Author Albert Hofmann. Not Known to Be Available for Sale Anywhere Else, At Any Price, In Any Condition. 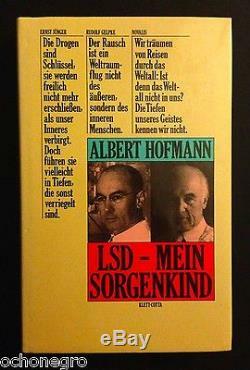 Albert Hofmann (January 11, 1906 April 29, 2008) was a Swiss scientist known best for being the first person to synthesize, ingest, and learn of the psychedelic effects of lysergic acid diethylamide (LSD). Hofmann also was the first to isolate, synthesize, and name the principal psychedelic mushroom compounds, psilocybin and psilocin. He authored more than 100 scientific articles and a number of books, including LSD: My Problem Child. 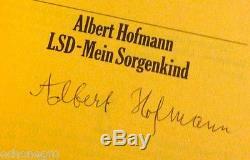 The item "VERY RARE SIGNED True 1st Edition LSD Mein Sorgenkind by Albert Hofmann (German)" is in sale since Thursday, April 25, 2013. This item is in the category "Books\Nonfiction". The seller is "ochonegro" and is located in San Francisco, California. This item can be shipped worldwide.